Have you been having tummy trouble? Not feeling quite yourself ? 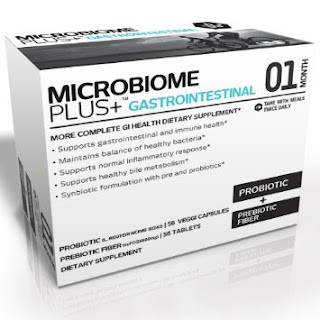 I recently had the opportunity to try out Microbiome Plus GI Advanced Probiotic and Prebiotic. It has made a big difference in the way I feel. I feel so much healthier and happier. I have had tummy troubles for years and I was willing to try something that not only promises to help, but really does. Microbiome Plus supports your gastrointestinal and immune health, maintains the balance of healthy bacteria, supports normal inflammatory response, and supports healthy bile metabolism. The box comes with 2 bottles inside. One is prebiotic fiber, the other is probiotic. Take one of each twice a day with meals. The gut is 80% of your immune system, where the good bacteria (probiotic) battles with the bad bacteria to help relieve allergies, bloating, gas, and constipation. Probiotics help maintain the good bacteria for a healthy immune system and healthy digestion. When your digestive system isn't working correctly your body isn't able to absorb vitamins and nutrients properly, which can leave you feeling fatigue, irritable, and without motivation. When you give your body the probiotics it needs you feel more energetic, and happier. Microbiome Plus supports bile metabolism, which means that you can lose fat easier and help maintain a healthier cholesterol level.